"Hello! 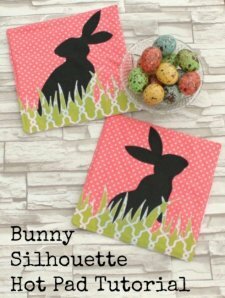 It's Amy from Friends Stitched Together with a tutorial for these fun Bunny Silhouette Hot Pads! I am so excited for Spring and all the fun, bright colors that are popping up in the fabric stores now. I made these specifically for Easter, but I think they'd be cute year round in all sorts of color combinations. Th bunnies and grass can be cut from some of those larger scraps we all seem to have sitting around. What do you think of these hot pads?